ONE Plus One, The flagship killer gets a price cut of Rs. 2000 ($32) in India. The 64GB, Sandstone Black version was priced at Rs.21,998 and now slashed to Rs.19,998. This is because the company is going to launch their new flagship phone 'Oneplus Two' this July and it might me priced between 22-30k (need confirmation). The Oneplus One is exclusively available on Amazon and after a few days it will be sold out through Flipkart too. OnePlus has also launched a Bamboo StyleSwap Cover for the device which costs Rs.1,499 on Amazon.in. 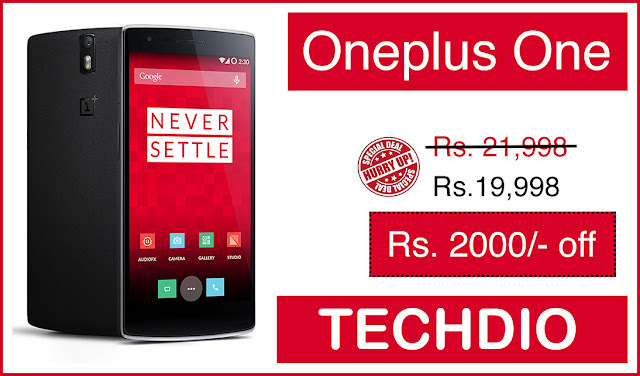 Now the price of Oneplus One has increased back to Rs.21,998. But the price will drop again within few weeks.